The laser keyboard wirelessly connects to your tablet, phone, laptop (or any other compatible gadget that could benefit from a keyboard) via bluetooth. It then projects a full size 63 key QWERTY keyboard onto any flat service which you can then tap on like a regular keyboard. It has a detection rate of 400 characters per minute which will be more than adequate for the majority of us. It can also be used as a mouse replacement, in this mode you swipe your finger on the virtual mouse pad, kind of like touch screen. You charge the virtual keyboard via USB, a full charge will give you 150 minutes typing charge. 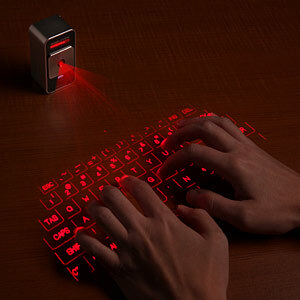 The laser virtualkeyboard is currently on sale at ThinkGeek for $149.99. This gadget is an old-school 🙂 It looks great and has a very interesting feature, but I still can not understand is it convenient to knock the fingers on the table? For me – not.